Sample the action from the other side. 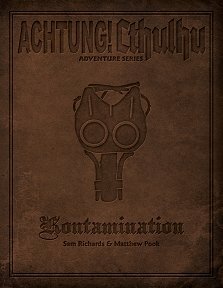 Publisher's blurb: "Kontamination is a standalone adventure for both hardened Achtung! Cthulhu veterans and newcomers alike, set in late 1944 as the Allies press their advantage and make for the German border. Keeper advice includes how to set the adventure at different times and different fronts in the war to provide flexibility for including it in your campaign."